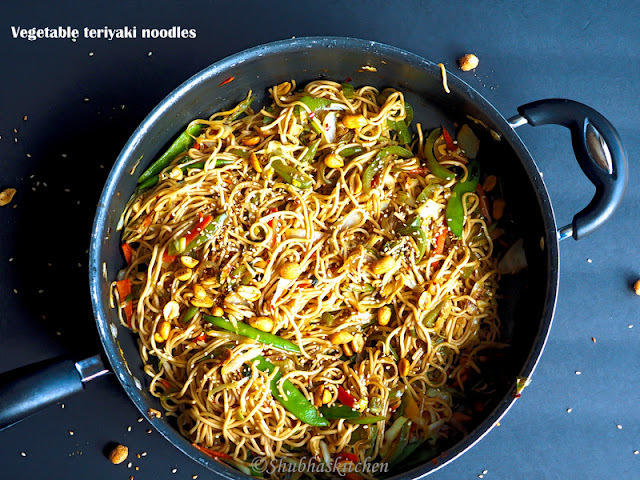 Vegetable Teriyaki Noodles is a delicious , easy to prepare and mildly spiced noodles. Some time back , I had bought Knorr's Teriyaki Noodles. We tried it and loved. I wanted to recreate that and this recipe is a work towards that. I have added a little more heat to suit my taste buds. 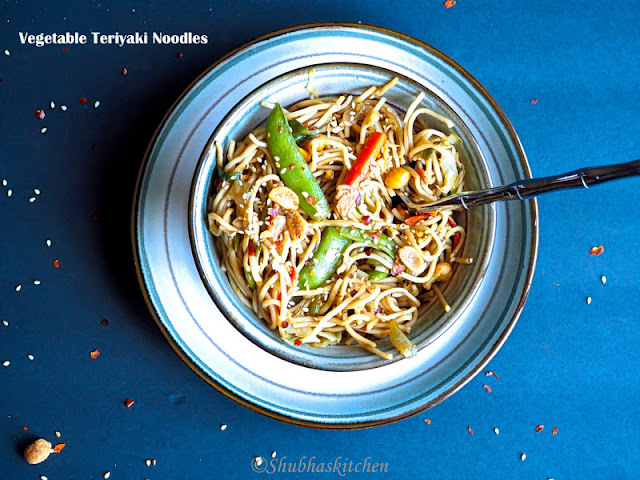 I have made this recipe so many times now and shared these noodles with friends too . My family and friends all loved it so much. Dry roast the sesame seeds and set aside. Bring a medium pot of water to boil. Add the noodles and cook until slightly done (al dente) or cook as per the package instructions. Drain the water and set aside. In a bowl, take the ingredients under the "sauce mix" section. Whisk and mix well. Heat 2 tbsp oil in a big pan / wok. When hot , add the onions , ginger and garlic. When the carrot, green beans and sugar snaps peas. Cook for 5 mins. Once the veggies are almost cooked, add the remaining veggies (cabbages, bell peppers and green onions). Cook for a minutes. Add the sauce mix and cook for a minute or two. 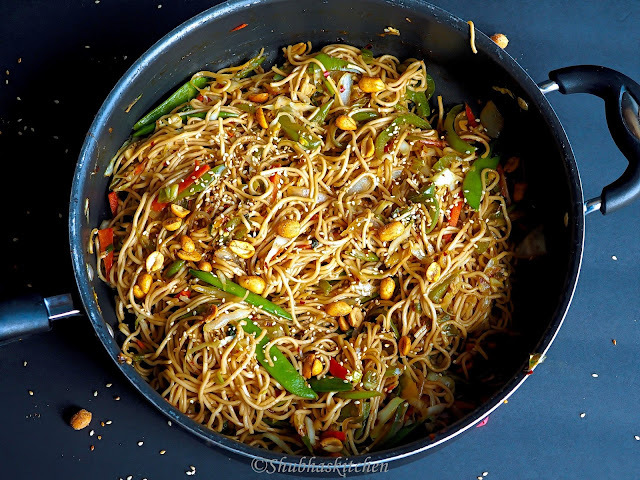 Add the cooked noodles. Toss it well so that it is well covered with the sauce. Adjust the seasoning if needed. Lastly add the toasted sesame seeds and spicy peanuts. Serve hot. Serve some Sriracha sauce on the side for added spiciness / heat. I tried making this recipe with thin rice noodles and was not very happy with the overall texture. Slightly thicker variety of noodles like udon or hakka work well. 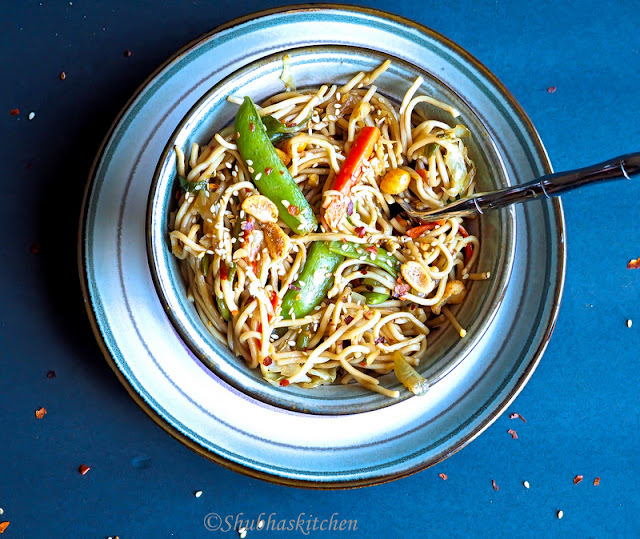 You can adjust the Sriracha sauce and dry red chilli flakes as per taste. You can play with the choice of vegetables. You can include brocolli, water chestnuts etc. love the texture and overall presentation. Thanks for the yummy recipe. Wow! !..Very tempting...Looks so delicious...want to just grab the pan and polish it off!! 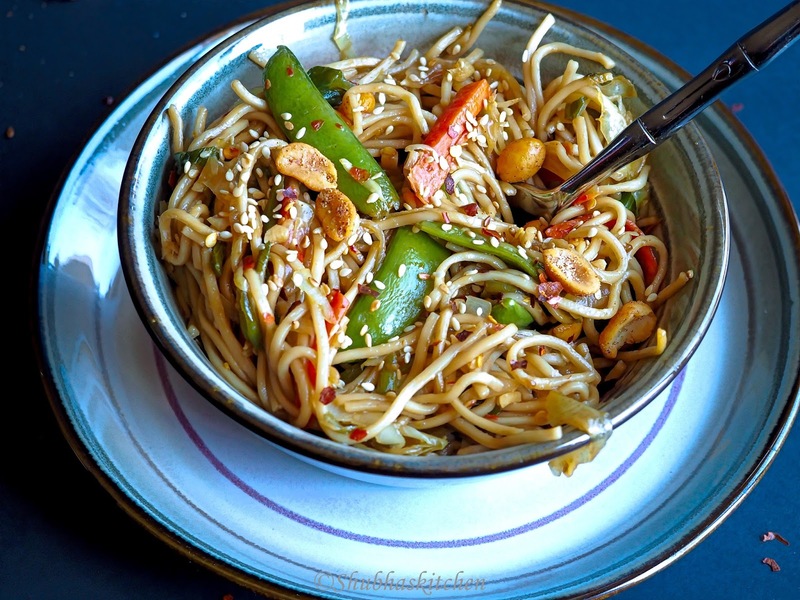 Delicious looking dish, and so flavorsome with veggies :D Hope you are doing good dear! Haven't seen you on G+. Yes, I am doing good ..ty:) Juggling between different social media platforms becomes difficult at times..
Just when I was confused on what should our next vegetarian meal be, I see this place of wholesome goodness. Thank you for making it easy for me. Loved. Omg..this looks amazing. Noodles are my all time favourite and this looks yummy. You made me hungry.